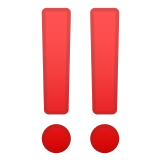 ‼️ Double Exclamation Mark Emoji was approved as part of Unicode 1.1 standard in 1993 with a U+203C U+FE0F codepoint, and currently is listed in 🎶 Symbols category. 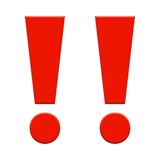 You may click images above to enlarge them and better understand Double Exclamation Mark Emoji meaning. Sometimes these pictures are ambiguous and you can see something else on them ;-). 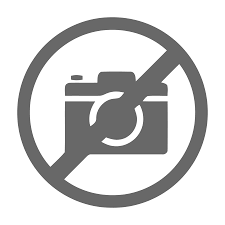 Use symbol ‼️ to copy and paste Double Exclamation Mark Emoji or &#8252;&#65039; code for HTML. This emoji is mature enough and should work on all devices. You can get similar and related emoji at the bottom of this page.